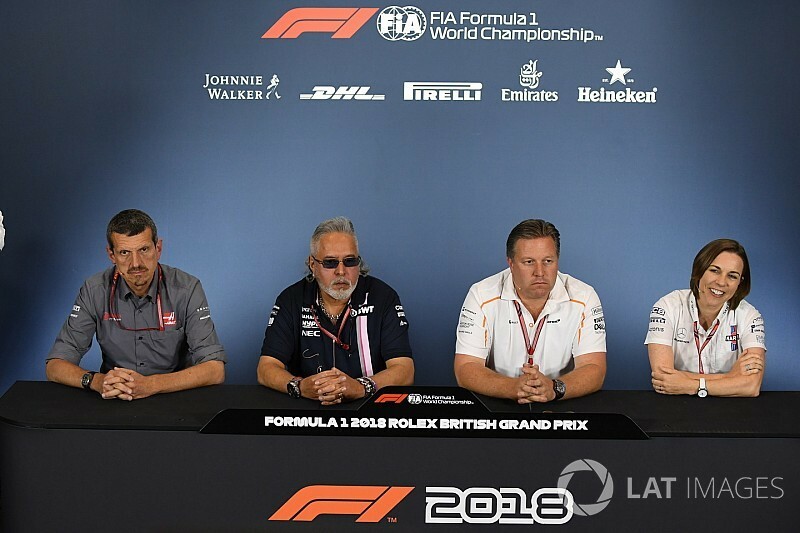 TEAM REPRESENTATIVES – Zak BROWN (McLaren), Guenther STEINER (Haas), Clare WILLIAMS (Williams), Vijay MALLYA (Force India). Q: Zak, since the last grand prix in Austria, you’ve announced some management changes at McLaren, so let’s deal with those first. First of all, why did Eric Boullier resign? Zak BROWN: Well, ultimately you’d have to ask Eric that questions, but in my conversation with him earlier this week, you know we’ve been under an immense amount of pressure, really even before Eric started, and I think ultimately the pressure and the desire to have McLaren move forward, I think he felt that a kind of a fresh start would give us the best opportunity, so he took that decision, accepted it earlier in the week. He’s been in racing a long time, won a lot of race and I’m sure we’ll see him a pit lane soon, again winning. Q: So, how are you filling the void left behind? ZB: Well, we’ve done a few things. It’s the start of a journey to get back to our winning ways. It’s going to take a little bit of time and a lot of hard work. We’ve got the energy, we’ve got the support from our shareholders. We promoted Andrea Stella to Performance Director and ultimately he’s responsible for getting the most out of the race car at a race weekend. We brought in Gil de Ferran, who we worked with at Indianapolis last year and who has been doing some consulting and advisory work earlier in the year, as Sporting Director, and his role is to work with the team, the drivers, Andrea, and all of us to ultimately get the most out of the team environment at a weekend. And then Simon Roberts, who reports to me as COO, stays in charge of all the technical aspects to make sure that when we show up on a Friday at a race weekend we have as fastest a race car as possible and as many new bits to throw at a car to continue to develop it. And that’s going to be what you see here this weekend, but as I said, it’s the start of a journey, so we’re just getting started, we’re not finished. Q: And how have the drivers received the news? ZB: Very well. I spoke with Fernando, Stoffel and Lando just the morning before we made the announcement. I think they have got a lot of trust in the team. We communicate very well. Fernando is someone who has a tremendous amount of experience. Like with all the team members, when I walk around the factory, I seek information, draw on experience, because we have so much experience inside McLaren, so many great people who have won a lot of championships and races, and Fernando has had the benefit of being at multiple different teams. I know there has been some conversation about was he consulted. I think sometimes people take words a bit too literally. It’s my role to talk and communicate with all the team – drivers, engineers, mechanics – all throughout since I started. So I take on all that information and then work with the leadership team and the shareholders and make some decisions and move forward. Q: Thank you. Claire, we’ve just heard about the changes being made at McLaren. Are further personnel changes needed at Williams to get you guys more competitive? Claire WILLIAMS: Listening to Zak, it’s a very similar story that is going on at Williams at the moment. We’re in fairly similar positions. Of course in order to effect change, you need to make changes and you need to make some hard decisions and we’re going through that process at the moment but it’s not a case of rushing into it. Sometimes when you rush in you can make decisions you don’t want to make and end up regretting those decisions. We’re undertaking a full evaluation of our internal structures and processes at the moment. We haven’t completed that work yet, so we don’t have any news to announce. But it’s mostly about identifying the talent that we do have in-house. We have a lot of great people at Williams that are working really hard at the moment in this difficult situation that we’re in. So it’s focusing on that, focusing on the good that we have and then seeing whether we need to augment that talent, augment that resource we have and then move forward from there. Q: So, promote from within – that’s the message? Q: OK, what about Silverstone this weekend: it’s your home grand prix, how frustrating is it for you personally to be turning up at the track where the team won its first grand prix, its 100th grand prix, with the team in such an uncompetitive state? CW: Yeah, I think I was quoted as saying that I was dreading coming here, earlier this week, and I have been because as you said this is a track that holds a very special place in everyone’s hearts at Williams, for a variety of different reasons. This is our home race, there are a lot of Williams fans here, Finally I’m seeing some fans with Williams Martini Racing t-shirts around the place, which is great to see, and we have let our fans down. And for us that is as equally disappointing as we all feel at the moment with our performance. However, coming here and being here yesterday has been a really nice boost for everybody and for me in particular. You get to see all our great fans, who do still support us through these difficult times. They continue to support us and I think yesterday, just being here amongst the British fans, has given us a real boost. We had a good morning this morning in practice. As I said, we’re doing a lot of work to bring upgrades to the car, but really considered upgrades as well, and that’s taken a bit of time to get the upgrades here to this race. But hopefully with the result of that hard work… I’m not saying that Sunday is going to be a turnaround in our performance, it’s still going to be a long road for us, but hopefully we will do a better job for our fans this weekend. Q: Claire, just a final word, your father was at the track yesterday. Is he in good heart? CW: He is. He is thrilled to be here. It’s really lovely to see him back in the motorhome. I think he’s causing a bit of panic in the garage at the moment. The boys haven’t had him in the garage for a number of races now. So it’s good, it keeps everyone on their toes, but it’s just lovely to have Frank back in the paddock, he’s a real icon of the sport and this is where he belongs. Q: Thank you Claire, good luck this weekend. Vijay, it’s the first time we’ve seen you in an FIA press conference this year, so could we just have your assessment of the team’s progress in 2018? Vijay MALLYA: Well, we’ve not had the best start that we were hoping for. We haven’t managed to get both cars into the points. We’ve had three of four first-lap incidents, all of which contribute to where you are in the Constructors’. I have every confidence in my people across the road at the factory. They are used to punching above their weight, which is something that I truly appreciate. We find ourselves two points behind McLaren and seven behind Haas, thanks to their special performance at the last race, and we’re 20 points behind Renault. We have been 20 points behind Williams two years ago and we still managed to secure fourth. I remain cautiously optimistic that we will get fourth again in the Constructors’ Championship in 2018. We brought a small upgrade to the car here at Silverstone and FP1 has shown it. Whether I’m at the race, or at an FIA Press Conference or not, the guys are doing a great job. Q: Certainly the two guys in the cockpit are doing great jobs – Esteban and Sergio. Both very talented, very consistent. With the driver silly season hotting up what do you feel you have to do to retain both your drivers for 2019? VM: The drivers are very happy in our environment. They have said that several times to the media when asked. We are very happy with both Checo and Esteban. 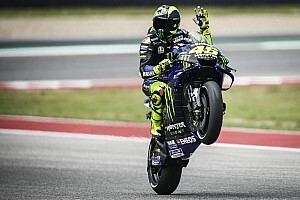 If, of course, they get a seat in a world championship-winning team it’s going to be a tough task to retain them, but if they are not offered any such opportunity, I see no reason why they should not stay with us, because we give them the opportunity of being best of the rest. We have shown that for the last two years and hopefully we will show that this year as well. Q: Guenther, an unfortunate incident for Romain in that first practice session, what can you tell us about the state of his car? Guenther STEINER: We need to change the chassis, so he will not be going out in FP2. As simple as this, yeah, he had some damage on it and he will not make FP2. Q: A frustrating day for him and the team. But let’s look at the positives; if I can take you back four days to Austria, where things went better. What was the overriding emotion for you when both cars crossed the line? GS: I think it was like… because we knew we could do this. We had a few races where we could do and for one or another reason we never got to do it. We performed at this level. For sure, we were a little bit lucky with some of the first six dropping out, half of them basically, so that’s why we ended up fourth and fifth, otherwise we would have been seventh and eighth. But we knew could do this and it’s just ‘OK guys, this is what’s possible. It happened now and let’s try to do more coming here’. It’s one thing when you have a result like this, you cannot wait for the next race to go to. It was a long wait, but now we’re back to a normal day in the office: one car we need to change chassis, the other driver is with the stewards right now. We’re just getting normal now again. I hope we can get it back together tomorrow and have a good race on Sunday, more like Austria. You cannot always think it’s going perfect because it went perfect once. We still have work to do. Q: I asked Vijay to assess the performance of his team a moment ago. Can I ask you specifically about Romain Grosjean – the ups and downs of his season. To go from fourth last weekend… How important was that fourth place, first of all for the team? GS: For the guys that work on Romain’s car, they were getting anxious because we had so many good moments and then we never got it home. So for finishing fourth they were very happy and I think the morale was fantastic week as you can imagine, they are back home, and plus they finished fourth – and now they have to change a chassis. Q: And how important was it for Romain? GS: I think very important. He knows he can drive a car. It just didn’t happen. As I said before, for one reason or another it never happened this year that got into the points. And then on his first points scoring getting 12 points was very good. I think he was relieved, I would say. Q: (Scott Mitchell – Autosport) Question for all four of you. We’re now reaching the end of a triple-header and there’s talk of about the calendar possibly expanding next year. Could I get your respective thoughts on the possible repeat of the triple-header next season and whether you think we’re already at the limit for the number of races over the course of the season? ZB: I think it’s been difficult, the three races back-to-back. Everyone’s tired, everyone’s powering through it. My understand is its most-likely not going to have a triple-header again next year. That’s what was discussed at the FOM strategy meeting earlier this week but I don’t think that’s set in stone. If we have to do three again, we obviously will. I think most of the teams, if not all of the team – I’ll let them speak for themselves – would probably not prefer three races. And as far as the expanded calendar, that discussion I don’t think applies to 2019. The conversation around 22-23 races is, I think, a few years out. I think we’ll probably see 20, maybe 21 again, next year. And as far as having 23 races, you have to take budget into consideration, and we obviously have budget caps coming, which we support and is going to be very healthy for the sport and the competition. We need to take into consideration all the men and women that work at these racing teams and travel and the big sacrifices they already make to go to 21 grands prix – but at the same time, commercially, if you put another two or three races on the calendar: a Miami, a New York, another one in Asia, some big markets, it’s pretty attractive commercially to our partners, to go there. I don’t think there’s a magic number. We’ll ultimately race at however many are put on the calendar. CW: I share Zak’s thoughts. Personally, for me, I’m quite enjoying it, I quite like going racing, so three in three weekends is great. Equally, it means that our season will be over quicker, if you’ve got three race weekends in three weeks that’s a good thing for us at the moment! I think the most important thing is about the people, and taking into account, the guys, the boys and girls that work for us, they put in an enormous effort, and to put in a triple-header, when they’re not able to get home, is a tough thing for them and for their families. We’ve had to do quite a lot of work around ensuring our guys can get a break and to go home. And even if that’s just for 24 hours, that’s really important. But again, that’s additional management for people that have got to cover that off and how we bring in people to cover those people to cover those people that aren’t then there for that day. Covering the work that they need to do. So it’s a really difficult logistical piece. Just moving our motorhomes, you’ll have seen in the paddock in Austria, half of us didn’t have our normal motorhomes that we have. I actually think, for the Austrian promoter, that was probably a shame that they got our test hospitality units. It doesn’t make the paddock look good over a race weekend. Just small considerations that that that sometimes we don’t necessarily think through when these decisions are made. As Zak said, I don’t believe a triple-header will appear on the calendar again. I think maybe we’ve learnt our lesson that it is quite a tough gig for everybody. And as far as more races coming on the calendar in the next few years, great from an entertainment perspective for our fans. Great to have different locations coming on the calendar – particularly for partners if they’re activating in those markets – but as long as that’s balanced and race weekends are looked at in their entirety, maybe to shorten them to mean that people are away from home as much as they possibly need to be, then I think that’s important. Vijay, can we have your thoughts please. VM: I agree with what Zak and Claire have said. My major concern is, of course, for our race team personnel. Triple-header is hard, 21 races is hard, but as Zak said, more races means more revenue, and if I can have one and a half or two race teams and I get paid by Formula One Group, I’d certainly consider it because we want the revenues to improve and we want to certainly get more money. But if things stay the same, then I think more than 21 races and these triple-headers are just too taxing for our engineers and mechanics and all those involved in the race team. GS: Nothing to add. I agree with everything. I think we all agree on what we said. Q: (Alan Baldwin – Reuters) Question for Claire. You mentioned the situation with your situation and McLaren. McLaren have had a couple of years thinking they had the best chassis but blaming it on the engine. You’ve known you’ve had the best engine in the sport and have done for several years. So how’ve you got into this predicament and what are the financial implications of it? CW: There are a variety of reasons as to why we found ourselves in tenth. You don’t get to tenth without having a number of issues. I think it’s probably clear to see that our aerodynamic package is probably the key to that, and unlocking the issues we have around the aero performance of our car is going to be critical to moving us forward. As we’ve gone through this recovery programme, we’ve identified a number of other weaknesses within the car and the team itself. I think as you go through that analysis invariably you always find other fires that you’ve got to put out. To be fair, it’s probably been a very useful exercise from that perspective, to go through that process and identify all your weaknesses, which we decided we were going to do when we realised the car wasn’t where we needed it to be after testing. And that’s going to give us an opportunity to actually make greater steps forward for us. But it is a long road. I think Zak was talking about two to ten years earlier. This isn’t going to be the work of a moment for us, unfortunately. With the environment, as well that they’re operating in, in Formula One at the moment. The teams that were weaker than us last year have suddenly catapulted ahead of us, and they’ve made great in-roads for a number of reasons. And those are challenges to us, being an independent team now in this sport is a very different world now to face than that which we were facing a few years ago. From a cost perspective, inevitably, this situation in which we find ourselves is going to have ramifications for us financially. Not least the prize-fund money we’ll receive for taking home tenth place will be considerably less than our forecasted P5. We lose Martini as our title partner at the end of this year. As much as we were expecting that and can budget for it, it still leaves a hole and finding sponsors when you’re in P10 is not going to be an easy piece of work for us. We had to spend additional money as well, in order to activate our recover programme. It’s not easy but we’ve got some very clever people working within that realm at the moment. We have a great CEO, we have a brilliant CFO who are doing everything they can to make sure we have a strong and healthy budget to go racing and compete successfully next year – but it’s not an easy world at Williams at the moment. Q: (Anthony Rowlinson – F1 Racing) Claire, obviously your name is above the door, as a Williams. Could you just explain what Williams mean to you? CW: I’m Harris now! Is that a good excuse, not above the door anymore? For me personally, this is very difficult, it’s heart-breaking and it’s a little bit soul destroying. This is mostly my family’s team and it’s been within our family for four decades now and the sacrifices our family have made for the team over the years have been great – but we’ve also had an enormous reward and feel enormously privileged as a family to be involved in this amazing sport. And I took on this role as DTP back in 2013. I felt that I could contribute and I think we’ve done some good work to turn the team around and take us back to where we wanted to be. This year hasn’t been great for us but it is a blip. We had in 2014 and 2015 two third places and in 2016 and 2017 two fifths, and we must look at this is just a trough. Every team in any sport goes through those moments. Personally for me it’s incredibly difficult to see the team go through this. We all hold our hands up and take responsibility and not least I have a part to play in that and we must all look at ourselves and make sure we’re doing the best job that we possibly can for this team because this team deserves to stay in Formula One. This is all we do. We’re in Formula One because we love going motor racing and we have to make sure that we create a world at Williams that keeps our team viable in this sport and relevant in this sport and still maintains our status in this sport. That’s hugely important to me. Q: (Dieter Rencken – Racing Lines, Racefans.net) Zak, on Wednesday you announced that Eric had resigned the previous evening, yet you were almost immediately able to announce a complete restructure including the appointment of two directors, both of whom have very close ties with your drivers. This implies a flat-pack resignation so was Eric pushed or did he jump? ZB: No, Eric resigned but as I mentioned earlier, I’ve got really good communications with everyone in the team and so I’ve been working with Eric now, the last year and a half and there’s been a lot of pressure on him, really ever since I joined him before then. So this wasn’t something that was a surprise, it was something that we had started to discuss previously as we were working together on what was the best way forward for McLaren. Q: (Abhishek Tackle – Mid-day) Vijay, I know you get asked this every year but there has been renewed speculation about your future ownership of Force India. How do you respond to that speculation that the team is for sale? VM: In your question, you said renewed speculation, right? People have been writing about the ownership of my team for years now. I’m proud that we finished our 200th Grand Prix in Austria. It’s a big milestone for me, since I owned this team. I’m sure you will not see anybody in Force India, or indeed myself, walk around with a For Sale sign. And as far as all these rumours are concerned, and all the statements that keep appearing in the media, all I can say is if there is a credible offer with cash on the table, I will be the first one to discuss with my shareholders, see what they feel, and if, in the unlikely event we wish to sell the team, if there’s an offer that we cannot refuse, I will be the first one to announce it. Until then, speculation remains speculation. Q: (Cezary Gutowski – Przeglad Sportowy) To Mr Steiner, you seem very supportive and understanding towards your drivers so my question is what are your requirements and what qualities does a driver need to have to drive for Haas F1 team? GS: In the end, what I expect is that they make points and bring results, that is what I expect. With Kevin, he’s doing very well this year, so everything is achieved. Romain had a little bit of a difficult start to the season, the first third of the season, but Romain is with us now for the third year and he did very well the first two years. He did take a bit chance when he joined us because we were not given a lot of chances to succeed in Formula One as a new team, because some of the teams before us didn’t make it, so I think out of respect we need to give him the support to give him the chance to make points and he did in Austria, so I hope he’s doing the same here but I expect points from the drivers with a car like ours every weekend. Q: (Graham Harris – Motorsport Monday, MotorsportWeek.com) You represent typically the lean, independent teams and Zak, you spoke about the cost cap that you wholeheartedly support. There’s been much speculation that the leading three teams have got more money than they actually need and they are prepared to spend it and spend as much as they need to win. You actually don’t have that luxury. How are you going to breach that impasse where the big teams keep threatening to walk away if they are told to spend less? GS: I think that’s a job FOM has to manage because it has to do a balance with payouts and budget cut and so on. I think we as Haas F1 have no influence in these negotiations, to keep them on board, so we support it and I think that there is positive talks going on even with the big teams that this will happen. We just have to find a compromise that the big teams are happy and that we are happy and FOM is doing a good job in doing these negotiations with us and with the big teams and I hope later in the year we come to a conclusion to it and we move forward in 2021 with a little bit of a level playing field. VM: I wholeheartedly support the cost cap concept. I have also repeatedly appealed to the Formula One Group that the lopsided payments must be corrected and that independent teams such as ourselves deserve a lot more money. The basic concept is that money should not buy performance. We have to level the playing field and independent teams should also be given a fair opportunity to win a race. 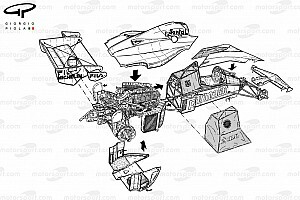 But if the manufacturer teams have an unlimited budget with the singular motive of winning races then we are being defeated not because of lack of technological skill or driver skill, we are being defeated by money power which shouldn’t be the case in any sport. ZB: I agree with everything Gunther and Vijay said. I think my build would be and I’ve commented earlier on the recovery plan for McLaren and I hedged my bets at between two and ten years for not wanting to get into the same mistakes we’ve made in the past couple of years of making predictions and statements that ultimately hadn’t come true. What I meant by that is the budget cap and until that comes in it’s fiscally almost impossible to challenge Mercedes and Ferrari. 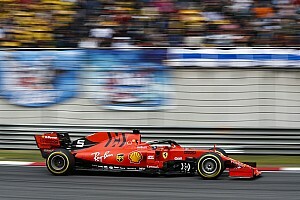 If we had an unlimited budget or their size of the budget we’d be doing the same thing, so they’ve done an outstanding job, but now they’re spending so much more than the rest of us, then they also have partner teams which not only benefit the partner teams who are doing an excellent job but it’s also benefitting Ferrari and Mercedes having alliances with multiple teams. So I think, as Gunther said, it’s Formula One Group’s responsibility to bring a better balance to the sport and let the best team win, so that’s why the next couple of years we’re going to be fighting very hard to get down to our championship fighting weight, if you like, and then be ready that when we’re all playing with the same size bat, which we aren’t today, that may the best team with the best technology, the best people, the best teamwork win and I’m excited and I think that’s coming and I think it’s coming in 2021. CW: I think whatever the rest of the panel have said, I would echo. I think that what we need to achieve in this sport now is absolutely fundamental for the very survival of certain teams in this sport, and I don’t think that that should be underestimated or taken for granted, the challenge that some of us are facing at the moment because of the circumstances in which this sport has arrived at over the past few years. It is incredibly tough for teams like ours and it shouldn’t be underestimated how important these new regulations for 2021 are in the influence that they could have over our teams’ survival. Q: (Dieter Rencken – Racing Lines, RaceFans.net) Vijay, you said earlier on that if your drivers got an offer from the front running teams, obviously it would be very difficult to retain them. Does the same not apply to your key personnel as well, because you’ve obviously had a very loyal staff but there are teams looking around, restructuring etc. Are you concerned that you may be losing some key personnel? VM: I have to admit that that’s something that I will not ignore but having said that, I have a fantastic team who love working for Force India. The culture across the road in our factory is very unique, very motivational and I have a passionate team of people. Yes, money is important and I guess people work to earn better but other teams have tried to tempt our people away in the past. They have not left us because there’s more to it than just a pay check, working at Force India. Great team, great leadership and they’re doing a wonderful job and I’m very proud of them. But, if people wish to leave, I obviously have to take action to replace them with equally good talent.